Do you have a place where you feel completely at home, relaxed, loved and secure? It’s a gift to have such a soul sanctuary, isn’t it? Though many of us struggle to find it and some miss out altogether, maybe due to the unkindness of others or their own limited ability to seek out a safe place for themselves. Our homes are meant to be soul sanctuary havens. They’re supposed to represent the loving parental way God cares for us. But often they don’t. If you, like me, grew up feeling confined, insecure, unloved and unwanted because your family of origin didn’t provide the stability you needed to grow strong on the inside, then all is not lost. I found my safe place in God. He alone can provide the complete soul solace we need in life. Other people and things might try to plug the gap, and succeed to some extent, but God gives us the means to rest all that we are: our fear, pain and shame, our identity and name, our past, present and future, our weariness, brokenness, wounds and mess in Him. 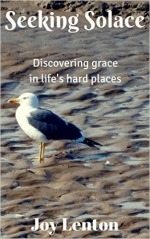 Adversity hits us universally but our ways of coping are as individual as we are. I’m learning to rest myself more in God instead of wearying myself out worrying about everything. Faith and trust, coupled with experience, have shown me it’s the wisest course of action, especially when I cannot help myself. By the way, dear reader, you might like to know that the poem above has been taken from my forthcoming new book, Embracing Hope: Soul Food to Help Chase Away the Blues, which is an eclectic mix of poetry, reflections and blessings and is due to be published soon! I chose it because I’m way too fatigued to think straight, and it’s about a place where my soul feels secure, loved and safe.